What happens to foreclosure when prices go up? 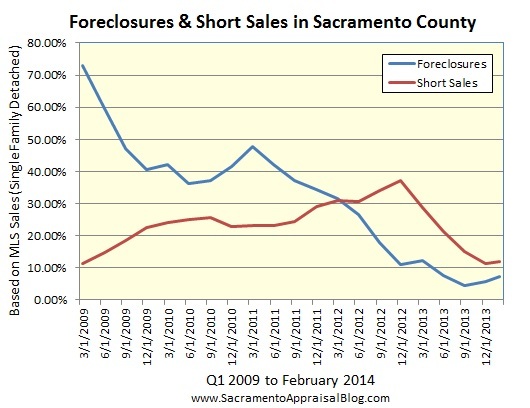 When prices increase, what happens to the rate of foreclosure (REOs)? Let’s take a look at price range segments under $500,000 in Sacramento County to see what we might discover. What stands out to you from the chart below? Generally speaking, the higher the sales price, the lower the percentage of foreclosure. There seems to be greater success with short sales at higher prices too, though the stats look pretty decent above $100,000. Does it shock you to see 83% of all sales under $100,000 as either bank-owned or short sales? Lastly, the total percentage of distressed properties consistently declines as price increases. What does that tell us? Let’s look at all counties in MLS also to see if we might see a similar trend. It’s always nice to compare one set of data with a larger set as a safeguard. Counties in Sacramento MLS consist of Sacramento, Placer, Yolo, El Dorado, San Joaquin, Stainslaus and portions of Merced, Yuba/Sutter and a few other places. What stands out to you? If you are a real estate agent, what are you seeing out there in the market? I’d love to hear your thoughts. Feel free to comment below.